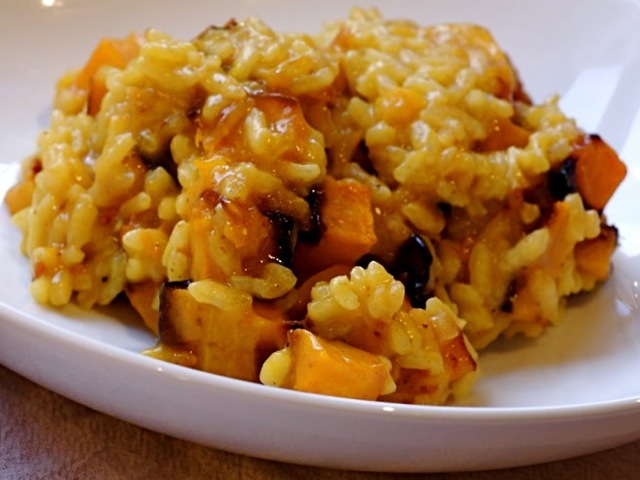 I used to avoid risotto because I thought you had to stand by the stove for hours, stirring — not exactly my style! But, I decided to give it a try and, instead, found a dish that's so delicious and cooks in 30 minutes. Test this first on your family and then when you have a party, you can invite your guests into the kitchen for drinks while everyone takes turns stirring the risotto. In a heavy-bottomed pot or Dutch oven, melt the butter and sauté the pancetta and shallots on medium-low heat for 10 minutes, until the shallots are translucent but not browned. Add the rice and stir to coat the grains with butter. Add the wine and cook for 2 minutes. Add 2 full ladles of stock to the rice plus the saffron, 1 tsp. salt, and ½ tsp. pepper. Stir, and simmer until the stock is absorbed, 5 to 10 minutes. Marcella Hazan advises that correct heat is important in making risotto. It should be "lively"; too high heat and the grains don't cook evenly, and too low heat will result in a gluey mess. It should cook in 30 minutes. After the first try, you'll get the idea. Saffron is collected from the stamens of crocuses, which is why it's so expensive. Use the strands, not the powder. Pancetta is Italian bacon. If you can't find it, use any good-quality bacon.